Dr. Virginia K. Stitt holds a Doctorate in Music Arts from the University of Iowa, a Masters of Music, Woodwind Specialist from Michigan State University, a Master of Arts in Music Education from the University of Northern Colorado, and a Bachelor of Science in Music Education from the University of Illinois. She has taught students at all stages of their academic careers, from elementary school through college, and has worked in music education across the U.S., as well as in Canada. She has held positions at Frostburg State University (Maryland), the University of Iowa, the University of Northern Colorado, and Michigan State University. 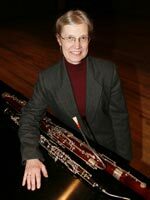 Professionally, Dr. Stitt has performed in Japan, Canada, and across the U.S. She is a former member of the Grand Rapids Symphony, the Bach Festival Orchestra of Kalamazoo, the Lansing Symphony (all in Michigan), the Cedar Rapids Symphony in Iowa and the Ottawa Symphony in Canada. Currently she continues performing with the Southwest Symphony and the Orchestra of Southern Utah as well as in local chamber music groups and musical productions. At SUU, current courses include: flute, oboe and bassoon studios, Chamber Music, Woodwind Methods, Music Theory, and Form and Analysis. Dr. Stitt was recently named Outstanding Music Educator of the Year by the Utah Music Educators Association.